On August 9th, 1945 the United States dropped an atomic bomb named “Fat Man” on the city of Nagasaki, Japan. The plutonium used in the bomb was produced in southeastern Washington at the Hanford Nuclear Site. A multi-disciplinary exhibit called Particles on the Wall (POTW) explores the human and environmental legacy of nuclear technology, specifically focused on the global implications of the Hanford facility. Since its debut in January 2010, POTW has traveled to nine communities within Washington and will soon be traveling to the Natural Capital Center for its first showing in Oregon. A free opening reception of Particles on the Wall will be held on Friday, May 3rd from 6-8 p.m. at Ecotrust’s Billy Frank Jr. Conference Center. Covering 586 square miles alongside the Columbia River, Hanford is owned by the federal government and operated by the U.S. Department of Energy. 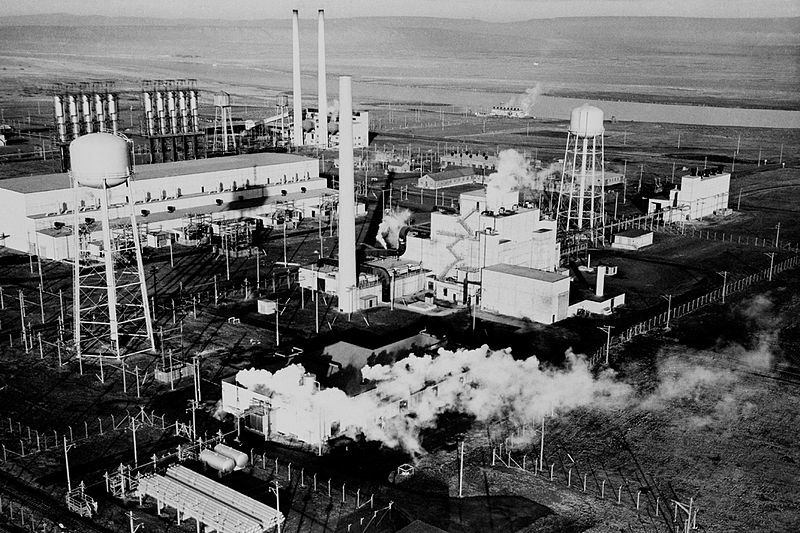 The site began production in 1944 and was commissioned to supply plutonium for the Manhattan Project, which included the first nuclear test, codenamed “Trinity.” Two-thirds of the plutonium used in the nation’s stockpile of nuclear weapons between 1944 and 1988 came from Hanford reactors. Decommissioned following the Cold War, it is still home to 53 million gallons of chemical and radioactive waste from over three decades of plutonium production. The B Reactor—the first reactor ever built, which supplied the plutonium for the Nagasaki bomb—was designated a U.S. National Historic Landmark on August 19th, 2008. It is open for public tours. From a dank cooling pond. Materials from POTW have been gathered in a hard copy book, which can be purchased online, or alternatively downloaded as an e-book for iPad, Kindle, or in .pdf format. Downloads are free, but donations can be made to support the work of Healthy World Press and the Institute of Neurotoxicology and Neurological Disorders. Ecotrust will display a smaller installation of the exhibit from May 3rd—June 14th.